The mother-daughter team from Craftbits. "Ever dug around in your bag frantically for your phone, or a pen, or your camera and feel frustrated because you can’t find it amongst all your other things scattered in your bag? Or ever felt lazy to change bags because it’s just easier to take that same ol bag that you’ve been taking everywhere since it’s a hassle to transfer the contents inside your bag? 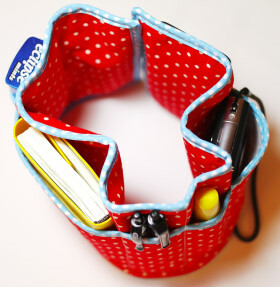 "Well you can say goodbye to those problems with this simple bag organizer! With 7 pockets that can fill a variety of things from notebooks to phones to mints, pens, and makeup, this collapsible form can fit medium to large sized bags with no difficulty—just open it up to increase the radius for larger bags (you can put big items in the middle, ie books, water bottle, sandwich bag), and wrap it around snugly to fit into smaller hand bags. "All your items will be easily accessible since they’ll always be standing inside your bag! Make it in bright colors for that pop of color to brighten your day, or in neutral hues for an inconspicuous look."